Click here to see previews and to get this DVD! Eight years apart, George Bush and his son, George W. Bush, have succeeded each other at the head of the world's most powerful nation. An unprecedented phenomenon in American history. The key events of the last twelve years have taken place during their terms in office: the collapse of the Soviet empire and the Communist bloc, the first Gulf War, the events of September 11, the globalisation of terrorism and the new conflict with Baghdad. Who are the Bushes? Apparently, the “quiet dynasty” of modern America. But in reality a “dynasty” whose inconceivable family secrets are painstakingly concealed. The grandfather of the current President, Prescott Bush, made his fortune by managing Nazi companies after Hitler seized power. In 1942, his companies were confiscated for collaboration with the enemy. George Bush Senior, Ronald Reagan’s Vice-President and then President from 1988 to 1992, armed and financed Saddam Hussein. He approved the shipping of germ warfare strains to Iraq, thus enabling the country to launch a chemical attack against Iranian troops and the Kurdish population. This film aims to pass through the looking glass and to show how the Bushes, father and son, have not only dined with the devil but have often invited themselves to his table. The bin Ladens and the Bushes have always been business partners and the family of the future terrorist chief indirectly financed George W. Bush’s political career. This unnatural alliance has continued since the September 11 attacks: Bush Senior is a top official in one of the biggest private investment funds in the USA, Carlyle, a group that has invested heavily in the arms industry: the Bradley tanks and the missiles used in the latest war against Iraq are made by firms controlled by Carlyle… and the bin Ladens. For the latter are Bush’s associates within this investment fund. 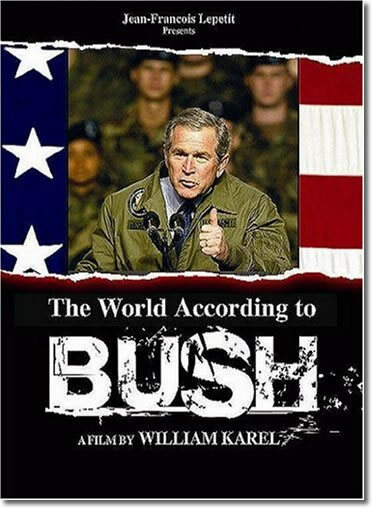 "The World According to Bush" is based on fully verified facts and eyewitness accounts. It offers a disturbing and striking portrait of the exercise of power at the head of the world’s leading democracy, as well as of the unacceptable alliances that have been forged and that remain painstakingly concealed. The Bushes’ feelings of total impunity have attained their peak during the professional career and the political ascension of George W. Bush. His decision to attack Iraq and overthrow Saddam Hussein’s regime already appears as one of the most fascinating historical and political conundrums for historians to ponder over in the coming years. No thriller or political fiction screenplay could have imagined the workings of such an intricate plot. Unfortunately, its actors are not fictional characters but, on the contrary, a man and a team who hold the fate of the world in their hands. For the first time in the political history of the USA, a small group of people, working together for thirty years, has more or less taken over American foreign policy and totally overhauled it, silencing all opposition. Behind the proclaimed global strategy, we find not only considerable economic interests but also a possibly more disturbing aspect, a religious project that George W. Bush identifies with completely, initiated by extremists who are part of the President’s direct entourage. Religion has taken on an all-important role since his arrival at the White House. Never before in the history of the world’s democracies have one man and his team acted with such arrogance and impunity, defying international law and creating an unprecedented grouping of interests: the project blends politics and personal interests in an atmosphere of total cynicism. The latest war against Iraq, with its totally unforeseeable consequences, hides another danger, that of seeing America launch further "civilizing" operations of a similar type, imposed by force, fired by ideas that are at best naïve and at worst totally hypocritical, calculated over a dangerously short term.